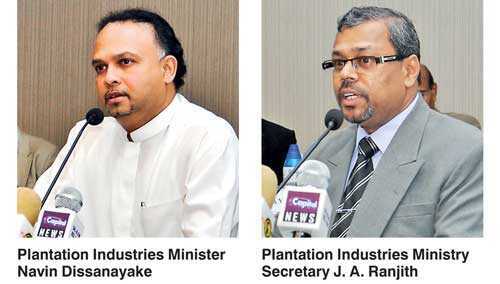 Plantation Industries Minister Navin Dissanayake reassured the industry stakeholders that he will fight for the 20,000 hectare approved for palm oil cultivation, insisting to follow up on the policy decision. “I will fight with you on the 20,000 hectares of land that has been approved for oil palm cultivation. The palm oil issue is up there, which is murky. I will fight for the interests of the industry in the same way I did for tea industry when the glyphosate issue came into play,” he said, addressing at a workshop for rubber and oil palm development of the regional plantation companies (RPCs) held at the Grand Monarch in Talawathugoda last Friday (1). The Minister remained unwavering that he would go ahead with the policy agreed to establish 20,000 hectares of oil palm in the country, pointing out that it was approved by the previous regime under Mahinda Rajapaksa. “This is not approved by our Government, but the Mahinda Rajapaksa Government that did this. Whichever government comes into power has to follow up on policy decisions and that’s my thinking. So the policy decision made by previous Government, we will defend. I as the Minister will always support you and stand by you. Consensus should be the rule of the day,” he added. Dissanayake highlighted the importance of developing a framework of actions and on the guidelines for palm oil industry, which will then allow him strong advocate on the approved 20,000 hectares. “The way things are happening in palm oil is going to be controversial even in the future. We need to make some policy papers on this, which has not been forthcoming. We haven’t got a proper thinking process, research analysis happening on palm oil. We haven’t got many institutions that are supporting palm oil. We have ad-hoc thinking such as the Coconut Research Institute (CRI), when it is not even one of the functions of the CRI,” he added. He assured that the Government would not take decisions similar to the policies adopted by Malaysia and Indonesia, where they destroy large extents of forest cover to be replaced with oil palm, but emphasised that Sri Lanka needs to understand the science behind plantation economy. “There is a huge social stigma built up against palm oil. During my visit to Kegalle, I’ve explained to all concerned parties that we are not going to destroy our forests to plant 1,000 acres of palm oil. Malaysia and Indonesia were two diverse situations compared to Sri Lanka. We can’t do that here. If we try to do it here, we will be destroyed by the voters,” the Minister said. According to him, most of the critics were very emotional and unscientific, especially in the Kegalle area which he had visited for a discussion with locals, NGOs and environmental activists, while some protestors were being driven by intelligent and genuine concerns. The Minister also called on the industry to actively promote the positives of the palm oil, assuring them the support of the Ministry for publicity. “Organise some forums and scientists to come and talk about it. Despite all criticism during the tea issue, I always maintained the positive side and preached commercial agriculture needs weedicide. I kept on hammering that line, so whatever the positives you all see in palm oil you have to keep on saying that punch line. Don’t take a step back on it. If you want it, then fight for it,” he stressed. Plantation Industries Ministry Secretary J.A. Ranjith pointed out that Sri Lanka has engaged in cultivation of palm oil since 1960s, while charging the media and the NGOs for launching a huge campaign against oil palm cultivation in the country at present. According to him the Ministry in collaboration with the Plantation Monitoring and Management Division had prepared guidelines for the consultations with the oil palm. Plantation Industries Minister Navin Dissanayake on Friday insisted regional plantation companies (RPCs) that palm oil cannot be a substitute for rubber, noting that the Government would not encourage such policy. “Palm oil can be a supplement to your income, but it cannot be a substitute to rubber. I am very clear on that. Surely it is not the policy of the Government and Government cannot encourage that,” he said, addressing a workshop on rubber and oil palm development of the RPCs held on Friday at The Grand Monarch in Talawathugoda.Rubber, considered a fundamental crop that receives State patronage for its development, is currently facing adverse conditions with the falling prices in the world market. “Rubber is a fundamental crop in our country, while I understand that rubber is not making money at present. But it should be made to make money, because on economies of scale you can do that. Some of you have been a bit naughty. Although you don’t seem to express it, deep down you all think, that oil palm can be a substitute to rubber. I don’t think you should come to that decision, neither can we encourage that decision,” he added. Dissanayake also stressed that following the assessments carried out on the RPCs it has been found that most companies had performed well, while others were dragging the RPCs down, by not adhering to regulations. Nevertheless, the Minister expressed confidence with the future likely to ensure that the markets would turn to purchasing increased natural rubber as opposed to synthetic rubber, where Sri Lanka stands to gain as the country produces high quality natural rubber. “The Government and policy makers believe rubber has a long term future. That is why we are investing a large amount of money in the Rubber Master Plan and we have already set up a Rubber Secretariat. We are moving ahead with our plans. This is a stable product we have. Under my ministry I have to protect rubber and I hope you appreciate it. This has to be understood very clearly,” he pointed out. He was firm that rubber trees less than 30 years cannot be pulled down by the RPCs for palm oil cultivation. Dissanayake assured the industry that he would not intervene, but asserted that as the assets were public property the Government must resolve to protect it. “We don’t want to get involved or interfere, but these are public assets. We need to come to a win-win model in using them and have some teeth in monitoring. So, it is important that the industry come to a reasonable compromise in one voice with authorities,” he said. Plantation Industries Ministry Secretary J.A. Ranjith outlined the importance of the rubber industry economically and environmentally. Noting that the industry was not exploring the full potential of the sector, he called on the industry to prepare a productive future plan for the rubber sector. “Using rubber as timber is another valuable opportunity for the industry. At present we mostly use rubber just as firewood and don’t recognise it as a timber industry. Also there are micro-ecological factors. Rubber is said to absorb carbon dioxide more than other plants. In the realms of global warming and greenhouse gas emission, this is very important, because a thick canopy of rubber plantations, the excessive heat of the environment is controlled,” he pointed out. According to him, Monaragala district is now transforming from being one of the vulnerable districts to an intermediate climatic zone due to recent development of rubber plantations.